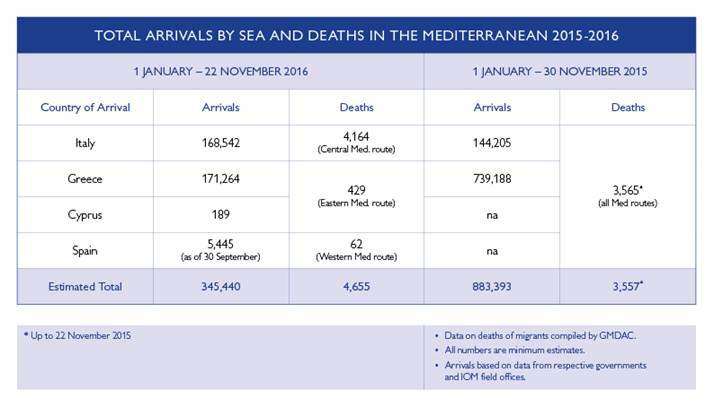 IOM reports that 345,440 migrants and refugees entered Europe by sea in 2016 through 20 November, arriving mostly in Greece and Italy. Some 171,264 people have arrived in Greece and 168,542 in Italy during 2016. The total is well below the number of arrivals at this point in 2015, by which time some 883,393 migrants and refugees had made the journey.